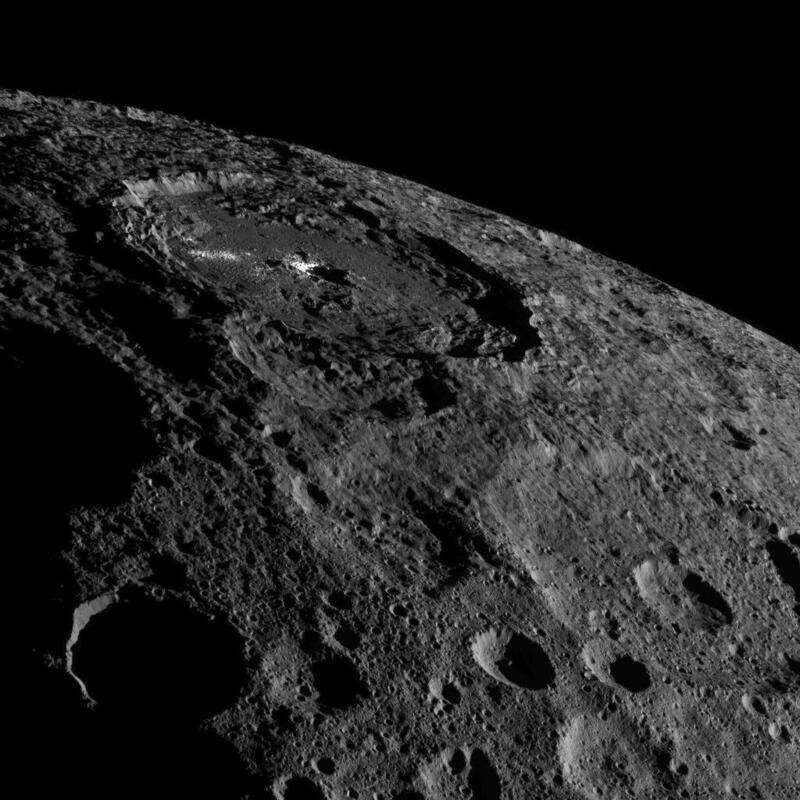 Can We Call the Bright Spot in Ceres’ Occator Crater a Cryovolcano Yet? Evidence is mounting around the cryovolcanic history of the solar system’s innermost dwarf planet — and its most recent eruptions may have happened within the last four million years. Since NASA’s Dawn mission arrived at dwarf planet Ceres in 2015, we’ve been treated to some wonderfully detailed images of the small world’s pockmarked terrain. Understanding the underlying processes of what is believed to be an ice-filled celestial body, however, is taking some time to decipher. But with more observations comes more understanding and planetary scientists are getting close to realizing what lies beneath those craters and, possibly, unlocking the secrets behind a very icy and very alien phenomenon we have no experience of in our terrestrial lives. That phenomenon is cryovolcanoes. And Ceres seems to have them. The most startling feature on Ceres is Occator Crater. This 57 mile-wide feature is the result of a massive impact tens of millions of years ago. Large craters on small worlds isn’t necessarily a strange thing in our battered solar system, but what is strange about Occator is the very bright feature (and small bright patches surrounding it) in the crater’s center. Even before Dawn arrived in orbit and only fuzzy images of Ceres were available, hopes were high that this bright anomaly in the otherwise gray Cererian landscape could be indicative of ices or some mineral compound that was formed by the presence of water. There have been many studies into Occator’s icy center, but new research into the crater’s age compared to the bright spot’s age appears to, once again, point to a cryovolcanic origin. Cryovolcanoes — or, simply, ice volcanoes — are hypothetical features that are believed to be common throughout the outer solar system. These ice volcanoes are thought to erupt in a similar fashion to the volcanoes we have on Earth, but instead of molten rock, these volcanoes erupt ice-cold volatiles — like water, methane or ammonia. Dwarf planet Pluto, for example, has features that look like cryovolcanoes, as does Saturn’s moon Titan and Jupiter’s moon Ganymede. These locations are extremely cold and known to contain large quantities of methane and water, so internal heating (caused by radioactive decay or tidal processes) melt the ices and force them to the surface. When they vent through the crust, gases are released and the liquids quickly freeze and sublimate. Around these vents, cryovolcanoes will grow, and if Ceres really does have its own ice volcanoes, this will be the closest planetary body to the sun (and Earth) known to have them. Now, in research headed by the Max Planck Institute for Solar System Research (MPS) in Göttingen, Germany, scientists using Dawn data have, for the first time, taken a stab at dating the age of the bright material in the center of Occator Crater and realized that the location has likely been the site of many cryovolcanic eruptions in the recent past. In the center of Occator, a pit measuring around 7 miles wide can be found, likely formed during the massive impact approximately 30 million years ago. But around the edges of that pit are mountains, some 750 meters high, and in the center is a cracked dome measuring 400 meters high and nearly 2 miles wide. This bright dome is called Cerealia Facula and surrounding it appears to be material that was spewed from a cryovolcanic vent. 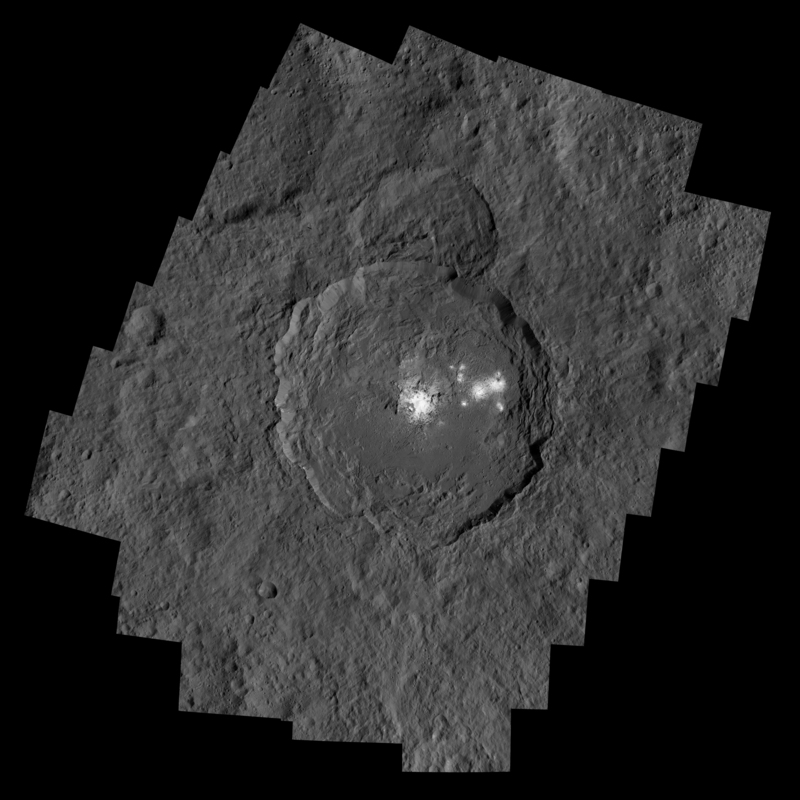 Analysis has shown that this material contains salts that were formed in the presence of water from Ceres’ interior and then deposited onto the surface. The minerals around Cerealia Facula has been dated to only four million years, meaning that there has been cryovolcanic eruptions long after the Occator impact punctured Ceres’ crust. “The age and appearance of the material surrounding the bright dome indicate that Cerealia Facula was formed by a recurring, eruptive process, which also hurled material into more outward regions of the central pit,” said Andreas Nathues, lead investigator of Dawn’s Framing Camera. “A single eruptive event is rather unlikely.” As noted in an MPS news release, Jupiter moons Callisto and Ganymede have similar features that are also believed to be related to cryovolcanic eruptions. “The large impact that tore the giant Occator crater into the surface of the dwarf planet must have originally started everything and triggered the later cryovolcanic activity,” added Nathues. Previous imagery of haze inside Occator Crater has led to the suspicion that ices remain on the surface today; the haze could be vapor from sublimating water ice exposed on the surface having been forced to the surface from Ceres’ interior. Evidence for this haze has been supported by other studies and appears to vary throughout the day as one would expect — increased sunlight would accelerate sublimation (ice turning from a solid to a vapor without passing through the liquid phase). If volatiles are still being extruded through this vent today, this would seem to indicate that, in addition to the cryovolcanic eruptions in the last four million years, some form of activity continues to this day. Add this to the recent discovery of organic material on Ceres’ surface, this small world has become a very big asset for planetary science.